ALPHA Bank launched a revamp of its e-Banking platform for private customers. The new web application features redesigned visual elements and user flows, covering wide desktop screens to 600px tablets. Engineered around the single page application philosophy, it delivers unprecedented UI responsiveness leading to a vastly improved user experience. 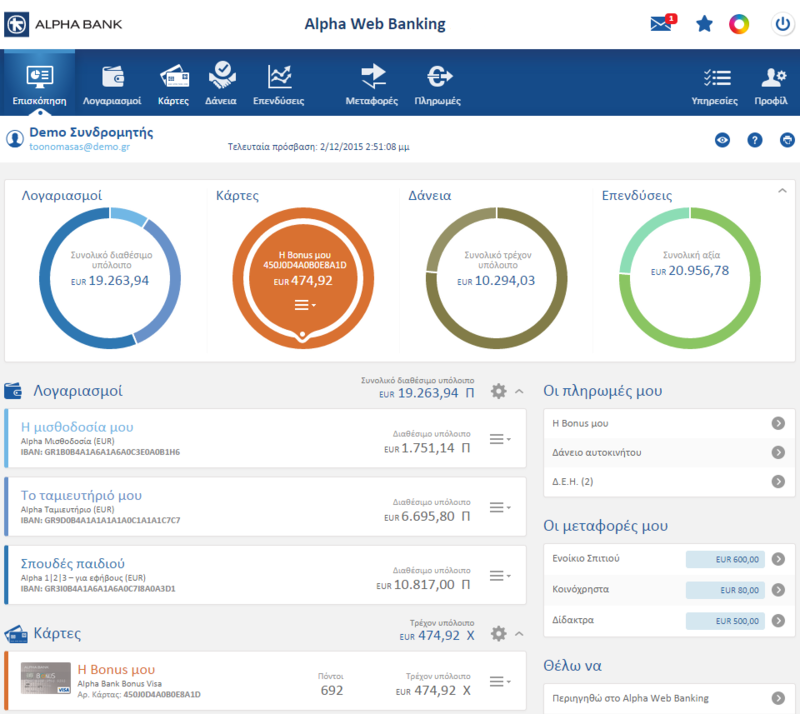 Indice was contracted by Microsoft Hellas to implemement the vision of this new ebanking experience. The new design called for doing away with server side page refreshes and POST backs. Our team was already building single page apps using the AngularJS framework and brought this experience to help bootstrap the project. Typescript was used as a typed language alternative, along with its excellent integration to Visual Studio. The application fully leverages client side caching of network data so as to improve user experience. The web application carries out a wide range of retail account transactions as well as providing access to related services such as savings accounts, cards and loans. It also supports profile management scenarios and management of electronic services provided by ALPHA. The redesigned inbox delivers relevant information to each user, while personal payment or transfer templates can be saved on a users profile. The visually stunning Dashboard homepage acts as a mini-view of the client’s status with the bank.